Derek McGrath is back plotting Waterford’s fortunes for a fifth season. 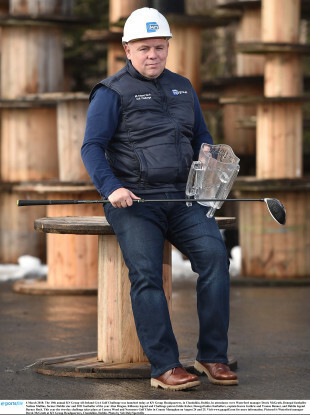 Waterford hurling manager Derek McGrath at the launch of the 19th annual KN Group All-Ireland GAA Golf Challenge. THEY WERE THE two luckless counties last September when the All-Ireland honours were being doled out. Waterford will this season be aiming to end a 59-year wait to lift the Liam MacCarthy Cup glory while Mayo must try to halt a 67-year barren spell since they claimed Sam Maguire. Derek McGrath is tasked with trying to steer Waterford to that breakthrough and recognises an affinity between the two counties with their sets of passionate followers yearning for success. “Say if you go down to Killarney to the mid-term break in October and you’re down there and you meet someone from down the country, they’d say ‘Ah Jesus I’d love to see Waterford win the All-Ireland’. “The you meet the next person and they’d say they’d love to see Mayo win the All-Ireland. There’s almost an affinity of how people feel about the two counties. “I think Mayo have been a lot more consistent in terms of their reaching of All-Ireland finals over the last seven or eight years. So I don’t think we’ve reached that level that Mayo have been at in terms of a top two or top three team. “I think what is very relevant is the nature of the people in each county, they long for it so much. They want it so much that everything is probably over-analysed and over-scrutinised. That’s why I’d have great admiration for (Stephen) Rochford from afar, just even tactical decisions he made coming into the Kerry game (last year) with the Donaghy O’Shea (match up). “Just not being afraid. Even back to the All-Ireland final replay where he replaced the goalkeeper a couple of years ago. He had a plan around the kickouts and he was willing to back himself on it. “(I’ve) just more of an affinity to what’s going on in their camp, not that we could mirror it but learn from it I suppose. I’d just be impressed how Mayo do their business in terms of going back all the time and just going at it all the time. The scale of challenge Mayo face has long been presented in the shape of the obstacles they must overcome. A crucial aspect off the pitch is the amount of players they have based in Dublin and McGrath can relate to that item of planning the journeys his players must undertake from the capital. “You would be conscious of it. We have Peter Hogan and Patrick (Curran) are in DCU, so they’re kind of still in the student mode. “Darragh Fives is teaching in St Benildus in Stillorgan, Tadhg (de Búrca) is in Oatlands, his second year of a H-Dip. Philip Mahony is teaching in Ardscoil. “They’re living together in the same house, Darragh, Philip and Tadhg are living with, I think, Cillian Buckley and Matthew O’Hanlon. “Stephen O’Keeffe, he’s in the Bank of Ireland, I won’t say he’s been well looked after but he’s able to get down. “We just try to mix and match. Like they came down last night. That’s probably on the back of not being able to get down from Dublin at the weekend. “But for instance, the Sunday that we played Cork, we didn’t ask them to travel the Tuesday because Tadhg and Philip had played 70 minutes, Paddy and them were playing the Fitzgibbon. “They normally do a ball alley session in (Kilmacud) Crokes and get a bit of grub in the Goat and that’s how it works for us when they’re not coming down. “But in terms of a drain? No, they love the anonymity, they love the whole scene in Dublin, in terms of working and living in Dublin, you’re away from a little bit of the bubble of Waterford. “We put them into the bracket of all or nothing, depending on what their needs would be. Like, Darragh’s been out injured, Darragh Fives, if he needs to get down for physio or rehab he will come down. You have to balance that against four hours in a car, going up and down, how he feels with his injuries. Waterford’s last league outing against Cork saw them finally accumulate some points after three opening losses on the bounce. McGrath had forecasted a struggle at the outset of the league. “It’s been difficult now. I probably flagged it, not in a cute sense. I just knew we hadn’t enough done. “I keep saying this that we have to be completely right on point in terms of our work-rate and intensity and levels of possessive approach to be at it and we haven’t been at that in any game thus far bar parts of the Cork game the last day. “We just have to stick to the process now and try and grind our way out of it and get some sort of nuggets of hope towards the championship, given the new championship format. Email “Waterford's affinity with Mayo, the anonymity for players based in Dublin and league struggles”. Feedback on “Waterford's affinity with Mayo, the anonymity for players based in Dublin and league struggles”.